Not too Transylvania based, more something else.. not Transylvania, based... ever seen a traditional dance with the traditional costumes? They look so bright and the whirling of the dancers almost almost looks like rays of sunshine... according to a legend, some people danced their way to Transylvania. Hmmm. 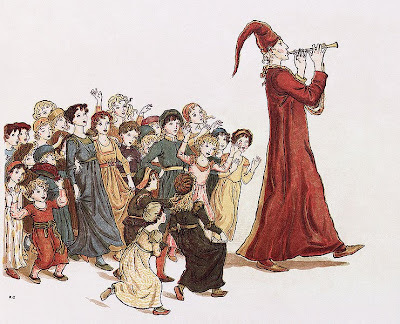 You've posted an illustration from the Pied Piper. Are you hinting they were led away from their old homes by the magic of the new land? Deb-- according to Robert Browning, the Pied Piper took them through a tunnel, and they became teh children of Transylvania.